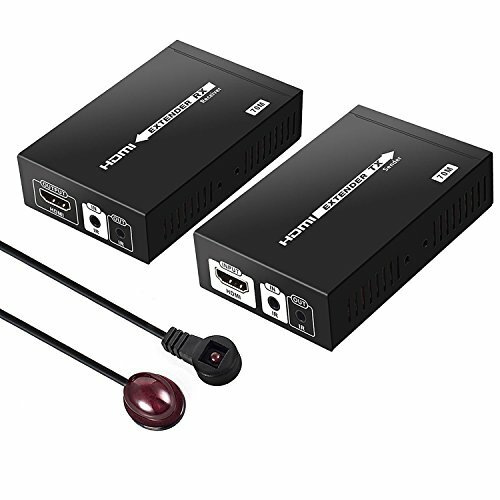 HDMI Signal: 4Kx2K, compatible with HDCP, support CEC and 24bits deep color. Audio: LPCM, DTS-HD, Dolby True HD. Network Cable: CAT5E, CAT6, CAT6A, CAT7. Infrared Back: Support 20-60 kHz wide frequency device and bi-directional IR transmission. 【4K HDMI Extender】Support 4Kx2K, 3D, 1080p and HDCP ,CEC, 24 Deep Color. High Resolution up to 4K over Cat6 Cat7 Network Cable, Enjoy Ultra HD Movie at Home. 【Up to 70m/230ft HDMI Extender】Extend HDMI Up to 230ft (70m) over a Single Cat6a Cat7 cable with HDBaseT Extend Technology. 【IR Remote Control】Support Bi-directional IR Pass Back, You Can Control DVD at TX End and Control TV at RX End, IR emitter cable and IR receiver cable included.